In this fascinating and informative video, Alberto Villoldo, PhD., introduces viewers to the luminous energy field that surrounds and informs our physical body like a blueprint of life. Unveiling the secret of ancient shaman-healers, he teaches us that many of our physical and psychological problems stem from imprints within our luminous body. Dr. Villoldo reveals the nature of this luminous field, how it acts as a blueprint for our physical body and how by understanding its nature, we can actually heal ourselves and each other. 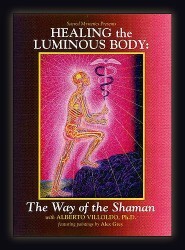 Once the luminous body is cleared, Dr. Villoldo explains, physical and emotional healing can begin. Trained as a Medical Anthropologist, Dr. Villoldo left the academic world behind twenty years ago to study among the Inka shamans. It was in the Andes Mountains of South America that he discovered the wisdom of the luminous body from the indigenous shamans. This ancient knowledge reveals the secret of true health and happiness. To aid Dr. Villoldo in explaining the luminous energy field, the paintings of visionary artist Alex Grey are presented. No other artist has depicted the luminous energy form in all of its intricacies as clearly as Alex Grey. Dr. Villoldo's presentation, together with Alex Grey's images helps all of us understand the nature of our spiritual and physical well-being. Many of our illnesses, psychological disorders, addictions and failed relationships can be traced to faulty imprints in our luminous body. In this video, Dr. Villoldo unveils how to heal and recover from these destructive imprints and regain our physical, mental and spiritual well-being. Join us as we travel to the Andes Mountains to learn the secret of the ancient Shamans, a secret that can lead all of us to health, happiness and beauty. "At last a deeply committed seeker, scholar, and teacher has brought the rich legacy of Native America forward to take its rightful place among the world's great spiritual traditions." "A refreshing air of integrity. Villoldo has dedicated his life to centuries-old healing techniques, and we should all be thankful..."
"True healing is more than eliminating symptoms. It is experiencing infinity and a "self outside of time that has never been touched by disease." Dr. Alberto Villoldo, along with t he aid of Alex Grey's mindbending portrayals of the human energy matrix, explains how the "Luminous Energy Field" surrounding the body (and known to shamans of every culture) is essentially our blueprint, informing our physical bodies and dictating what we attract into our lives. Villoldo shows how unhealed situations, relationships, traumas, and wounds accumulate like " pools of sludge" in the LEF, becoming highly charged and settling there as permanent fixtures of identity. Then when we get "triggered" by someone or something, it is our LEF that feels it first and, consequently, hijacks our central nervous system, leaving us virtually helpless to make different choices in the moment. But we each have the power to participate in our own evolution by healing and clearing this field, thereby altering forever what we draw into our reality." "Effective shamanistic healing methods are thought to have been taught in the Andes of South America through oral tradition during at least 50,000 years. Modern Western medicine aims to cure the symptoms of an illness and uses a terminology that suggest warfare such a "fight" and "battle." The Shaman assists patients in a transformative process to heal the deepest causes of the symptoms, ensuring the illness need not arise again, explains Dr. Villoldo, a psychologist and anthropologist with a background in medical research. Villoldo studied extensively with the shamans of the Inka tradition. He says his mission is to train Westerners in shamanistic work. The shaman mediates between heaven and earth and dances between the world of energy and the world of matter, Villoldo says. He demonstrates with fascinating imagery the energy field that surrounds our bodies; explains how illness and imbalance affects this energy field; and teaches methods for administering mental, emotional and physical healing. Point this instructional video particularly to customers working in healthcare and education." "About 20 years ago, Alberto Villoldo, Ph.D., a Medical Anthropologist, left behind his academic career to conduct field research among the Incan shamans of South America. During this time he was introduced to the concept of the luminous body - an energy field that surrounds us and acts as a blueprint of life. On this enlightening DVD, Dr. Villoldo provides an overview of luminous energy fields and how keeping these "bodies" clean from negative imprints can lead to health and happiness in life. Among some of the things that can be improved by healing the luminous body include the way you deal with illness, addictions, physical disorders, and failed relationships."